This is like speaking to my high school self, so loud. Someday soon I’ll have time to talk about everything that’s going on. It’s tutorials, and videos, and student collaborations, and peer review. But for now – I just liked this. I spent two years of my life diagramming sentences in middle school which I’m pretty sure no one else my age had to do, but at this point the whole experience has faded to a warm and fuzzy childhood memory. Plus! women’s suffrage! I have a more substantive post brewing, but I am about to head out on a whirlwind (and probably ill-advised) trip back east to visit friends, and I don’t think it will get done tonight. I wanted to mention a couple of things today, though, while they are still fresh in my mind. I taught WR 222 again today, which is a composition class that focuses on non-scholarly public discourses. When I do sessions for this class, I don’t have to talk about finding books, or scholarly articles so much as editorials, opinion pieces, letters to the editor, blogs, tweets, and the like. The students come in very early in their process too; about half of each class is still in the “what should I write about” phase. So I also focus on showing them places where they can browse lots of ideas, arguments, opinions and points of view. This is the class I wrote about here, and here. This year, I showed Newsmap again. It was the first time I really looked at it since it upgraded, and it is improved. Unlike last year, there is a search function now. It’s still a slice of Google News, and the search bits have some glitches. But for the students who don’t want to browse, and who still want the visual interface, it’s an improvement. This tool was a big hit again, most of the students at least tried it, and some stayed in it the whole session. I also showed some of the new additions to Google search- search options, unveiled this week at the Searchology conference. I haven’t really figured out how to make the timeline thingy work interestingly. And I haven’t browsed the options for narrowing down to recent information very much. Mostly, I wanted to show the Wonder Wheel, which offers its own visual search interface (h/t Caleb). It’s pretty fun to browse up and down connected searches. This one was popular as well, especially in the second class I taught today – in that group, I saw at least half of the group trying it out. Usually, when students come in to the library and I’m teaching, they have topics and they’ve done some work. I honestly don’t know how it would work to encourage open browsing in library databases – it might work out great, but still, I’m glad that when I have a reason to encourage it, it’s in this class where we can use these fun tools to do it. visual topic exploration – for reals? Remember back when I was sad about the demise of Ebsco’s visual search? I got over it, but I never replaced it with the beginning composition students. They still explore in Wikipedia, and a lot of them have fun with that, and I still talk about news browsing tools like newsmap in the advanced composition classes, but I haven’t had something to show that gets at that general idea of visual browse and topic exploration since the old visual search went away. Well, I don’t actually know. But I know the answer is “maybe” which is something. I was pointed to this tool this morning (still in beta, first area of concern is that I can’t tell if its going to stay free) — eyePlorer.com. It’s a way to visualize Wikipedia information, which is something we’ve seen before. But there’s something kind of fun and compelling about how it works. 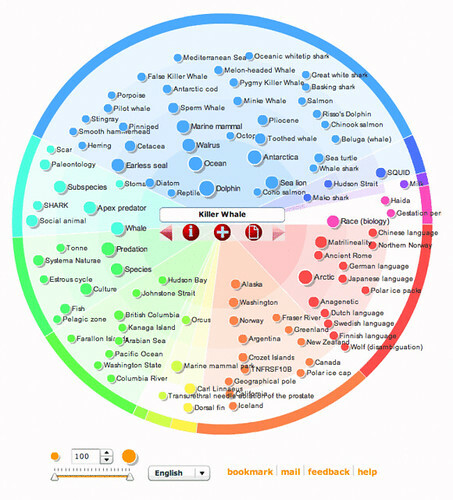 And there are some add-on tools within the interface that could be really, really useful in the topic exploration phase of the research process. Still, there are a couple of things that are giving me pause – I’ll get to those at the end. First, the good. It’s got circles. No, seriously, I mean it. It’s a fun interface to browse around in. When you start the tool, you get an empty circle with a search box. It does okay at figuring out the topic you want. My first try was the topic of a student paper from a while ago. I remembered this one because I had been pleased at the time that Wikipedia had a page for this student, specifically on their topic – orcas san juan. 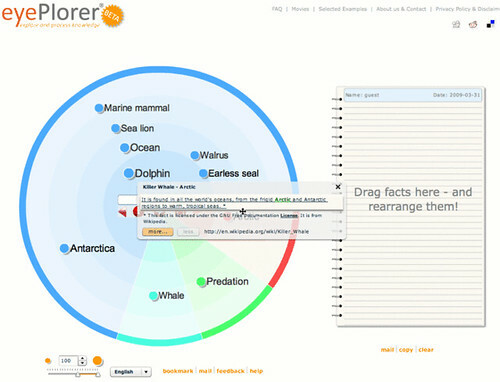 EyePlorer wasn’t able to figure out what I meant by that search, but when I backtracked broader to just orcas, it did. And better yet, one of the clusters of additional information was about places – and I was able to click and connect to information on the specific topic. If you click on the topics, you get a snippet from Wikipedia, and the option to get a little more. The snippet is a link which will take you to the wikipedia page. You can drag these snippets over to a notebook space, and move them around. The note book thing in particular seems really potentially useful during topic exploration. So why am I hesitant? Two things. 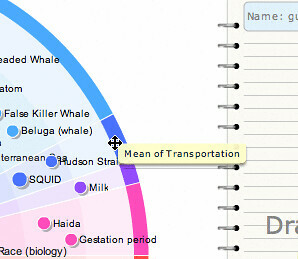 First, I don’t really get the being able to click through to the Wikipedia page thing, because all of these subtopics and broader topics took me to the same page – the killer whale page from which they were all drawn. It didn’t even take me to the part of the page the snippet was on, which would have put me closer to being able to click to another page — but I kept expecting to do that, to switch topics, within the tool and as far as I could tell in 10 minutes, I couldn’t. 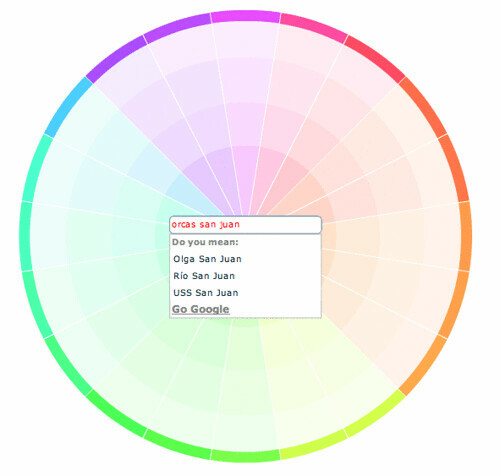 This connects to the notebook as well – unless you do another search on another set of keywords, the notes that you pull over and rearrange are really just rearranging an existing Wikipedia article. That’s not very useful. Your notes do stay on the notebook from search to search, so that’s good – but I think you would need to build in specific guidance about research as an iterative, back and forth process, and make it clear that to use this tool to its fullest they should expect to search on multiple keywords. That’s fine – research is like that and they should be prepared for back and forth and trying different things. But when the term you want is right there, and you know that it is a hyperlink in the initial article, it is a little frustrating to have to re-search to get it. The other, and more important hesitation is the clustering. Much of the informational material on the site is in German, which I don’t read, or in the form of videos, which I don’t use. So the answers to this might be there and I was too ignorant/lazy to figure them out. But I don’t really understand how these different clusters (like slices of pie – color coded? These areas are representing some kind of clustering) work. If you mouse over the edge of the pie, you get a label – and some of those made sense (like “place”) but others – not so much. This might be a beta issue, right now it looks like the same categories attach no matter what the topic – at least I saw the same ones for peak oil and orcas. And it also might be a language issue. 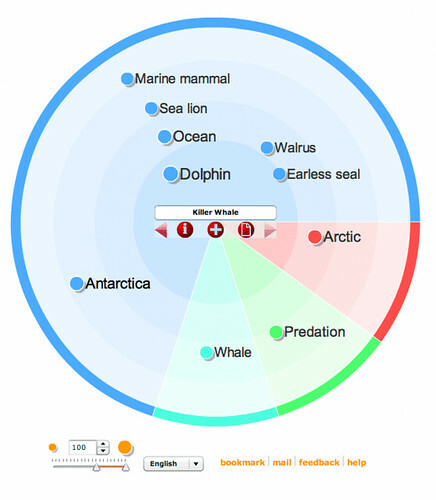 But I think this is worth keeping an eye on as a tool to encourage broad topic exploration. A little more than a month ago, I saw a reference to an article called Complexity and Social Science (by a LOT of authors). The title intrigued me, but when I clicked through I found out that it was about a different kind of complexity than I had been expecting. Computational social science could easily become the almost exclusive domain of private companies and government agencies. Alternatively, there might emerge a “Dead Sea Scrolls” model, with a privileged set of academic researchers sitting on private data from which they produce papers that cannot be critiqued or replicated. Neither scenario will serve the long-term public interest in the accumulation, verification, and dissemination of knowledge. See, the paper opens by making the point that research in fields like biology and physics have been incontrovertibly transformed by “capacity to collect and analyze massive amounts of data” but while lots and lots of people are doing stuff online every day – stuff that leaves “breadcrumbs” that can be noticed, counted, tracked and analyzed, the literature in the social sciences includes precious few examples of that kind of data analysis. Which isn’t to say that it isn’t happening – it is and we know it is, but it’s the googles and the facebooks and the NSA’s that are doing it. The quotation about gets at the implications of that. The article is brief and well worth a scan even if you, like me, need a primer to really understand the kind of analysis they are talking about. I read it, bookmarked it, briefly thought about writing about it here but couldn’t really come up with the information literacy connection I wanted (there is definitely stuff there – if nowhere else it’s in the discussion of privacy, but the connection I wasn’t looking for wasn’t there for me at that moment) so I didn’t. But then last week, I saw this article, Clickstream Data Yields High-Resolution Maps of Science, linked in the ResearchBlogs twitter feed (and since then at Visual Complexity, elearnspace, Stephen’s Web, Orgtheory.net, and EcoTone). The research is based on data gathered from “scholarly web portals” – from publishers, journals, aggregators and institutions. The researchers collected nearly 1 billion interactions from these portals, and used them to develop a journal clickstream model, which was then visualized as a network. For librarians, this is interesting because it adds richness to our picture of how people, scholars, engage with the scholarly literature – dimensions not captured by traditional measures of impact data. For example, what people cite and what they actually access on the web aren’t necessarily the same thing, and a focus on citation as the only measure of significance has always provided only a part of whatever picture there is out there. Beyond this, as the authors point out, clickstream data allows analysis of scholarly activity in real-time, while to do citation analysis one has to wait out the months-and-years delay of the publication cycle. It’s also interesting in that it includes data not just from the physical or natural sciences, but from the social sciences and humanities as well. What I also like about this, as an instruction librarian, is the picture that it provides of how scholarship connects. It’s another way of providing context to students who don’t really know what disciplines are, don’t really know that there are a lot of different scholarly discourses, and who don’t really have the tools yet to contextualize the scholarly literature they are required to use in their work. Presenting it as a visual network only highlights this potential for this kind of research more. And finally – and pulling this back to the Science article mentioned at the top, this article is open – published in an open-access journal and I have to think that the big flurry of attention is has received in the blogs I read, blogs with no inherent disciplinary or topical connection to each other, is in part because of that.